Marine Le Pen met Russian President Vladimir Putin in Moscow on Friday, and said the Russian leader represents a “new vision” of the world. 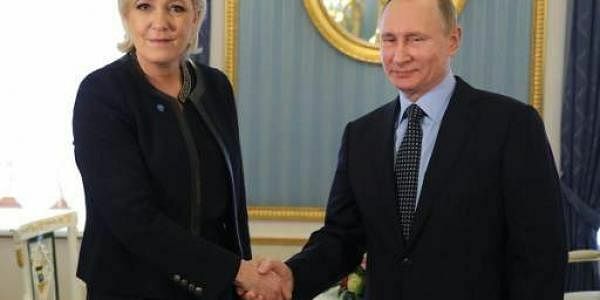 MOSCOW: France presidential candidate and National Front leader Marine Le Pen met Russian President Vladimir Putin as she visited Moscow on Friday, and said the Russian leader represents a “new vision” of the world, following her meeting with him. “He represents a sovereign nation,” Le Pen said. “I think he also represents a new vision. A new world has emerged in the past years. This is Vladimir Putin’s world, Donald Trump’s world in the United States, Mr (Narendra) Modi’s world in India,” she said. The Russian leader stressed that the Kremlin does not meddle in French politics. “We by no means want to influence the current events but we reserve the right to communicate with all representatives of all political forces of the country, as do our partners in Europe and the united states for example,” interfax news agency quoted Putin as telling Le Pen. “I know that you represent quite a fast-developing spectrum of European political forces,” he told her. The meeting between Putin and National Front party leader Le Pen—their first, according to Kremlin spokesman Dmitry Peskov—comes less than a month ahead of the French election, with the first round set to take place on April 23. Le Pen is among European politicians who have called for closer ties with Putin and approved of Moscow’s annexation of Crimea from Ukraine in 2014. She has visited Moscow on several occasions, enjoying positive Russian media coverage.